Sheree M. Marlowe was just 8 when she announced to her family that she wanted to be a lawyer. Raised by a single mom in Southern California, she came from an extended family where no one had ever been to college. She didn't know how she was going to get to college, let alone law school, but when she was a little older, she met someone who was black—and a lawyer—and she soon understood the transformational power of role models. 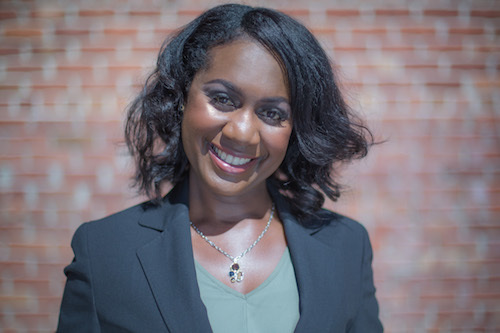 She went from working in a law office while in high school to graduating from UC Berkeley with an English degree, earning her Doctor of Jurisprudence from Golden Gate University School of Law, and practicing as an attorney for five years, specializing in civil rights litigation, employment law, and criminal defense. Now Marlowe is the new UC Santa Cruz Campus Diversity Officer for Staff and Students. "I believe that I made a difference practicing law, but it was limited to litigation," she says. "You have such a short time to spend with your client, and once they leave, you've either gotten them acquitted or they're convicted, and that's it. Or with civil litigation, you either win or lose a case or you get a settlement, and that's that." As a lawyer, she did admirable work, building cases and taking them to court. But it wasn't enough at that juncture of her career and professional life. "I wanted impact beyond individual cases, and when I realized that I could do that in a different field - in diversity and higher education - I resigned from my job as a lawyer, cold turkey." Within this emerging field of diversity, equity, and inclusion in higher education, Marlowe promotes institutional change for historically marginalized communities, which at UC Santa Cruz includes African American students, transgender students, and students with disabilities. She also wants to work toward achieving compositional diversity on campus, where there were only 37 other black staff members - 2 percent - when she was hired as assistant campus diversity officer in 2013. But diversity has so many more dimensions, she says. "I come from a unique perspective with my own experiences, but no matter who you are, you come from diverse perspectives, from different familial backgrounds, social-economic statuses, political views, religious differences," Marlowe said. "Everybody needs to be part of this conversation, and we have a shared sense of responsibility." Last year, Marlowe represented the University of California by testifying before the state Legislature as a policy expert addressing best practices for fostering such values. In response to the findings of the UC Campus Climate Study that were released in 2014, Marlowe was selected to lead the local effort to develop a campus action plan with regard to diversity, respect, and inclusion. That led to her serving as a co-leader in the Black Experience Team, which advises the chancellor and campus provost on ongoing recruitment, retention, and campus climate strategies surrounding African American, Black, and Caribbean students. Marlowe says she's already getting praise and criticism, something she acknowledges is an occupational hazard. Her colleague, Assistant Director for Equal Employment Opportunity Ciel Benedetto, agreed. "Diversity work is not for the faint of heart," Benedetto said. "It is a high risk/high reward occupation." One of Marlowe's duties is to manage bias-related matters that have been reported on the UC Santa Cruz Report Hate website. She says she has a deep conviction to address those concerns raised on campus. "When speech or a bias incident takes place that doesn't adhere to our values and principles of community, we want to respond with proactive engagement," she said. "We try to educate the community, provide resources, and refer to appropriate campus units for policy review and possible disciplinary action. It's difficult to strike a balance when some expect disciplinary action, but the speech is protected." Across the country, racially charged events have triggered a surge of student activism, tension, and threats of violence on college campuses. When Marlowe hears about those incidents, she's determined to provide even more resources, support, public speaking, and training - all in an effort to be an agent of change. "We can't solve national issues on our campus, but we can have courageous dialogues," she said. "Our job as a university is to make sure everyone can thrive academically and socially, and to create a safe and welcoming environment to the best of our ability. We need to be able to talk about what's happening nationally, and to be purposeful and intentional with what we do to affect people's lives." Associate Chancellor Ashish Sahni said Marlowe's distinctive background makes her a great fit for the job. "Sheree is uniquely positioned to do her job, because she understands the law and the constraint it brings but still has the passion for diversity and inclusion work," Sahni said. Does she still use her skill set as a lawyer? All the time. "I look at trends and data," she said. "I still do policy analysis and review programs. I approach things very strategically, but also with intention. I guess the difference now is that I get to experience the change beyond the courtroom. My hope is that my efforts will help today's students, staff, or faculty and the generations to come."